"Due to inclement weather in the Buffalo area, flight 1159 has been delayed..."
That’s the last thing customers want to hear when traveling in the hustle and bustle of the holiday season. Behind the scenes, Delta’s team of 25 meteorologists - larger than any other airline - is working hard to keep customers safe and advise flight crews on the best way to reach final destinations. Thunderstorms, hurricanes, snow, icing, wind shear, turbulence and even zone can affect Delta’s operations. But thanks to breakthrough meteorological advancements over the past few decades, the airline’s meteorologists are equipped with the tools they need to provide comprehensive, detailed forecasts. Observations from Delta’s own aircraft along with government observations and advisories are also valuable resources in the trade. As a result, meteorologists do a lot of monitoring, validating and verifying in addition to forecasting. Delta Meteorology is a combination of expertise and legacies from three airline weather departments, the first of which started in 1938 in Spokane, Wash. Today, Delta Meteorology is based in Atlanta as part of Delta’s Operations/Customer Center (OCC). Every day, the team provides weather briefings and estimated times of impact. Over 25 departments are represented in the OCC and include over 800 people who oversee more than 5,600 daily flights. 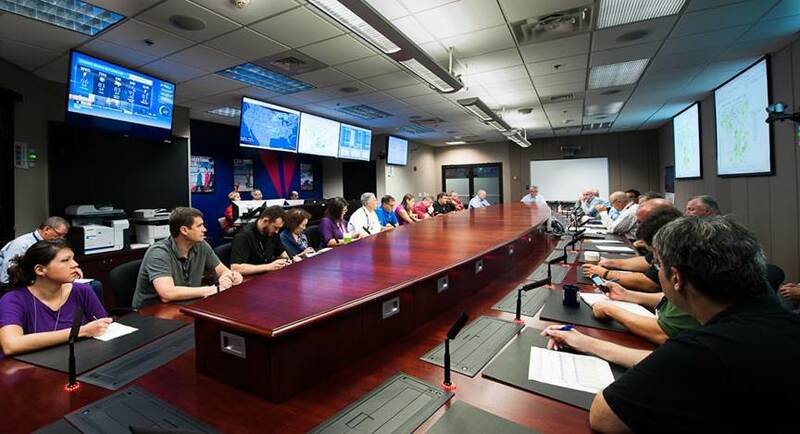 Delta Meteorology consists of two “surface desks” and three “upper air desks”, usually staffed by 11 meteorologists a day, including one Lead Meteorologist. They work as a team to monitor the weather for Delta’s global operation. The Lead Meteorologist’s or “team leader’s” primary duties are to monitor the next five days for major weather events, ensuring that timely forecasts are produced and added workload is delegated for any “irregular operations.” The entire team is led by Tom Fahey, Manager – Delta Meteorology. Meanwhile, the “surface desk” meteorologists look at Delta’s hub airports closely and put out detailed hourly forecasts, primarily for the next 30 hours. The “upper air desk” looks at high-level turbulence and other conditions such as space weather (i.e. solar flares), concentrations of ozone and even volcanic ash, which can damage an airplane’s engines. Delta Meteorology also represents Delta within the Aviation Meteorology industry and partners with other airlines and government agencies to work together, enhancing weather systems and promoting safety. For example, during the 1980s and ‘90s, airlines, the FAA and researchers worked on detection and other procedures to avoid low level wind shear. Since then, Terminal Doppler Weather Radar was installed in large airports, which enable forecasters to detect microbursts. Most airports also now have a low-level wind-shear alerting system, which notify air traffic controllers of dangerous air currents. In addition, pilot training includes microburst/wind-shear escape maneuvers as part of simulation training. Klipfel says she’s proud to be a part of such a distinguished group of meteorologists. Growing up, she was always fascinated by the weather and while in college, she learned one of her professors was a storm spotter. That’s when her interest became more than just a hobby and led her to where she is today.